First published in 1979. the edition pictured at the top of this page was printed in 1996 and contains a new foreword by Robert Christgau. In 1978, Greil Marcus asked twenty other writers on rock – including Dave Marsh, Lester Bangs, Nick Tosches, Ellen Willis, Simon Frith and Robert Christgau – a question: what one rock and roll album would you take to a desert island? The resulting essays were collected in Stranded, twenty passionate declarations that, appropriately, affirmed the solitary and obsessive activity that rock listening had become. Here are salutes, elegies, thank-you notes, and love letters to records such as The Rolling Stones’ Beggars Banquet, The Ramones’ Rocket To Russia, Captain Beefheart’s Trout Mask Replica, Something Else by the Kinks, and out-of-print classics by the Ronettes, Little Willie John, and Huey “Piano” Smith; the whole is supplemented with Marcus’s own invaluably annotated fifty-page discography, a “Treasure Island” of rock and roll. 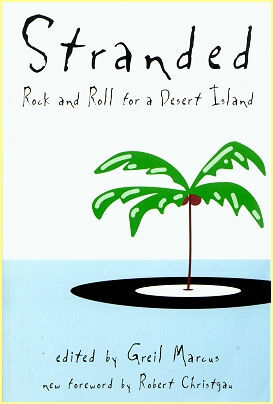 Stranded remains a classic of rock and roll literature, and perhaps the best possible answer to the question: what one rock and roll book would you take to a desert island?